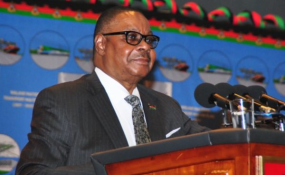 Cabinet Minister Everton Herbert Chimulirenji and Ntcheu North East legislator is likely to be Malawi's next vice-president as ruling Democratc Progressive Party (DPP) torchbearer incumbent President Peter Mutharika has picked him as his runningmate. Mutharika walked down the aisle of the Chichiri International Conference Centre, widely known as Comesa Hall, to present presidential nomination papers alongside Chimulirenji as a Democratic Progressive Party (DPP) pair. During the Cabinet reshuffle in November 2018, President Mutharika promoted Chimulirenji to Minister of Civic Education, Culture and Community Development from Deputy Minister of Defence. Mutharika described his running mate as "highly educated, loyal and mature." "He understands the difference between the role of vice president and deputy president. He understands also that there can only be one president at any given time that a vice president will never be a co-president," said Mutharika. Mutharika said Chimulirenji has been a DPP through and through. "I believe he will be a great vice president and will help me to run the government for the next five years," he added. Five years ago, Mutharika picked Saulos Klaus Chilima from he private sector where he was CEO of Airtel Malawi as his running mate who eventually became his deputy. However, there was a breakdown of relationship and Chilima - also from Ntcheu - dumped DPP and is in the May 21 2019 presidential race on the banner of UTM Party.